Knowledge and information are crucial for climate action. Vulnerable communities need to know how climate variables such as temperature and rainfall, and timing and severity of storm patterns and climate extremes may change, so they can adapt to protect themselves. This information needs to be timely, high-quality, relevant and accessible. Meeting these needs is the focus of an emerging field called climate services, which aims to bridge the gap between climate science, policy and practice for adaptation decision-making and disaster resilience. Climate services draw on a variety of sources: from scientific research and meteorological and climate models, to practical experience and local and indigenous knowledge. They also involve the process of co-producing knowledge and building the necessary skills and capacity of different user groups, both to guide the production and tailoring of climate information (to meet context-specific needs) and to be able to apply that information. This initiative* aims to develop new approaches for the improved design, use and interpretation of climate services, from the local to the national level. It will build on SEI's strong track record of producing climate knowledge, building capacity and supporting decision-making on development, mitigation, adaptation and disaster risk reduction. *Download the brief on SEI's Climate Services Initiative form the right-hand column. Addressing climate change effectively requires a great deal of knowledge and information, but often it can be difficult to find reliable, relevant and useful information to support decision-making. The emerging field of climate services is working to bridge the gap between climate science, policy and practice. This event "Building good climate services for adaptation: Insights from developed and developing countries", hosted with the Climate Knowledge Brokers Group, brought together climate information providers and users to discuss new approaches for the design, use and interpretation of climate services and efforts to better integrate them with other development interventions to effectively manage climate-related risk. Read about the panel and insights from the event in "What makes a good climate service? Learning from practice"
At the Fifth International Conference on Climate Services (Cape Town, 28 February–2 March 2017), which the SEI Initiative on Climate Services co-sponsored, SEI and the World Food Programme hosted a discussion on country-level implementation of climate services that offered valuable lessons about key ingredients for success. Read about insights from the event in "What are we learning about building effective climate services?" At Adaptation Futures (Cape Town, 18-21 June 2018), the SEI Initiative on Climate Services co-ran a session on Participatory Climate Services: improving their design, delivery and use. The session brought together climate service providers, intermediaries and potential end users (across varying scales and sectors and from the public and private sector) to discuss how to best address challenges of developing and integrating user-oriented, decision-driven and science-informed services. One of the greatest challenges in responding to climate change is how to pin down the information needed to understand the risks and plan effective measures to address them. The sheer volume of information available is overwhelming; even the expert reviews and syntheses provided by the Intergovernmental Panel on Climate Change (IPCC) fill hundreds of pages, packed with details. Sorting through it all, and finding the specific information that is relevant to the questions at hand, may be beyond the capacities and resources available to many decision-makers. There are also major gaps between the questions that decision-makers may be asking, and the answers available. A municipal emergency manager, for example, may want to know what flood risks her city faces over the coming 20 years, and what adaptation measures would best protect people from harm. But when she looks for climate projections, she might find only regional or national-level information. Or she might spend hours looking at flood mitigation measures and find that the conditions they are designed for simply do not match those in her city. The purpose of climate services is to bridge those gaps: to identify users’ needs and connect them to the relevant information. SEI's Climate Services Initiative is working in countries at all levels of development, focusing particularly on adaptation and disaster resilience. A key output of this work is a framework for co-designing user-driven, decision-orientated climate services - the Climate in Tandem framework. This framework is being able available as an interactive online guidance for the co-design of climate services that supports users to draw on existing knowledge from external sources as well as new interdisciplinary research. Exploring the long-term institutional arrangements and processes needed to bridge gaps between climate scientists and users, through knowledge co-exploration and co-production. Co-evaluating climate services with users to develop transferable lessons that can be widely shared. This SEI Initiative is using weADAPT.org to build an interactive online space that both provides information and guidance relevant to climate services and nurtures an associated community of practice. This space is the Using Climate Information theme, which will be updated regularly with publications relevant to the design and delivery of climate services, ongoing activities around climate services, as well as background information on climate science. For more detail about the work packages for CSI Phase I and the relevant case studies please refer to the SEI Climate Services Initiative Brief - download available from the right-hand colum. This SEI Initiative will build on case studies and SEI projects from across the world, and from the local to national level. The case studies that have been identified so far are detailed below. Case studies in developing countries will draw on participatory processes in Lusaka, Windhoek and Maputo within the context of the Future Resilience for African CiTies And Lands (FRACTAL) project, in which we work with stakeholders to integrate scientific knowledge about climate change and variability into decision-making processes relating to water, food, and energy systems and services. Further lessons on knowledge exchange and collaboration will draw on participatory processes for the co-generation of climate services taking place in other places including South Africa (Cape Town and Durban), Malawi, Tanzania, Botswana, and Zimbabwe. Case studies in industrialized countries will draw on lessons from the HazardSupport project and the recently completed Mistra-SWECIA programme in Sweden. The latter involved participatory adaptation research in the Swedish forestry sector. HazardSupport, which is ongoing, aims to develop risk-based decision support tools for adaptation to natural hazards in Sweden. Lessons from the Mistra-SWECIA programme will particularly inform world relating to communicating climate change. As part of this project the Swedish Forest Agency conducted a large communication project called Forestry in a Changing Climate. Results from the study will allow the initiative to draw conclusions on how effective climate change communication can change minds and behaviours related to climate risks and adaptation. The initiative will also draw on lessons from the PLACARD (PLAtform for Climate Adaptation and Risk reDuction) project, which aims to strengthen institutions to support climate change adaptation and disaster risk reduction at the national level in Europe. A key aim of the new Climate Services Initiative space on weADAPT is to foster mutual learning and sharing of insights from projects around the world. Engagement with both providers and users of climate information around the world is central to the mission of this initiative. 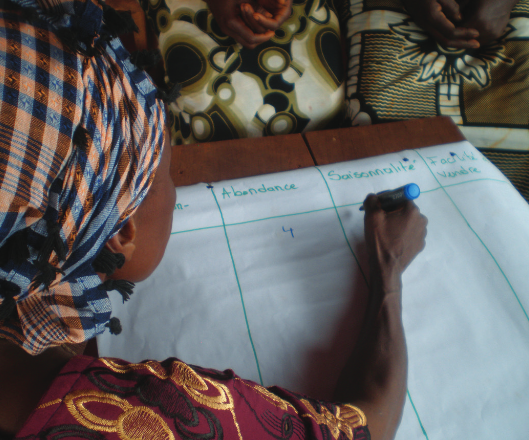 If you are working on climate services and have innovative projects, new methodologies, lessons from experience, or other insights to share, please join our online space on weADAPT: http://www.weadapt.org/using-climate-information. Any work shared in our online community will appear in our biweekly newsletter and social media channels, providing ample opportunities for collaboration with people around the world working in similar fields. You can also post questions to the wider adaptation community and engage in a dialogue around challenging issues. If you would like to collaborate in a more substantive way with the SEI Climate Services Initiative, please contact the co-leaders, Åsa Gerger Swartling and Sukaina Bharwani. To learn more about the initiative and see the latest publications, news and blogs, go to: http://www.sei-international.org/climate-services. Want your project here? Get in touch to explore opporunities for collaboration! Read about "Building bridges and changing minds: Insights from climate communication research and practice"
Read about "Using climate information to achieve long-term development objectives in coastal Ghana and Mozambique", part of the Future Climate for Africa (FCFA) Programme. Read about "Transformative Learning and Engagement with Climate Change Adaptation: Experiences with Sweden’s Forestry Sector". Read "Mung beans, cacao and climate: Hands-on learning for adaptation planning in small islands". Find out more about the Climate Knowledge Brokers. Discover more about SEI's research on Transforming Development and Disaster Risk and Climate Finance. Davis, M., Barrott, J., Bharwani, S., Gerger Swartling, Å., Coll Besa, M., Vulturius G. and O. Johnson (2016) The SEI Initiative on Climate Services. SEI Initiative information sheet. Stockholm Environment Institute: Stockholm, Sweden.